Julian Assange's Wikileaks is a Zionist Hydra operation. The hydra is a mythical multi-headed beast that regenerates a head (two heads at a time in certain instances) whenever one is severed. Israel’s Wikileaks intelligence operation is the physical embodiment of this slimy, slithery, fictional creature. Exposed by Anthony Lawson. Utterly destroyed by Veterans Today Senior Editor Gordon Duff. Slammed by Dr. Alan Sabrosky. Blasted by Jeff Gates. Shredded by Susan Abulhawa. Beat up by the Empire Strikes Black blog. Demolished by American Everyman owner Scott Creighton. Pierced by Lila Rajiva. And picked apart piece by piece in a thorough, exhaustive debunking by this author, still, Wikileaks just won’t go away. The cat was out of the bag from the very beginning, with it being touted by one of the Zionist media’s top assets, TIME Magazine. In an even more flagrant display from the Zionist criminal network, Wikileaks received top billing from puppet president Obama’s information Czar, the originator of cyber COINTELPRO, Cass Sunstein. This wasn’t enough however; the PSYOP hadn’t penetrated deep enough into global consciousness. It hadn’t resonated strongly enough with the ‘truth movement.’ Enter Julian Assange, the rockstar whistleblower traveling all around the world with billionaire friends, corporate Zionist lawyers, high-priced photo shoots, thousand dollar suits and of course, his omnipresent media partners. 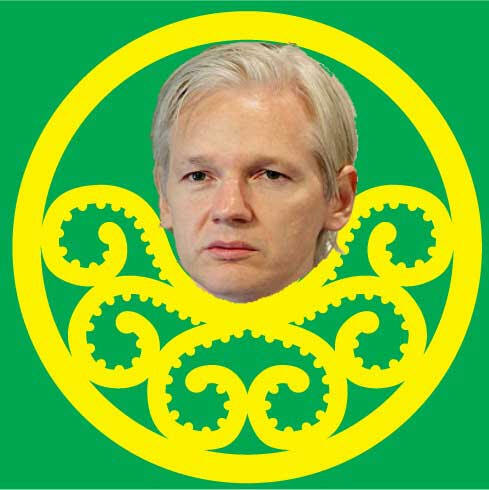 Under the wing of the mass media, Julian Assange became a head of the Wikileaks hydra loved and cherished by the world. His fame soared to new heights with the Afghan War Diary. A diatribe of the foulest Zionist propaganda. Pieced together with lies about long-dead Bin Laden running around Afghanistan, the Taliban acquiring ground-to-air missiles and Pakistan (a chief enemy of Israel) coordinating all of the madness, Wikileaks’ motives became evident to those who could see. Any mention of Russian-Jewish gangsters trained by IOF selling weapons to CIA-backed warlords? Not a chance. Any mention of Mossad and the CIA taking control of the heroin trade? No shot. Any mention of the TAPI pipeline, controlled by Mossad front company Merhav? Not even close. How about a mention of the Zionist entity training and arming the Taliban? Keep dreaming. In fact, Israel wasn’t mentioned a single time. The subsequent release regarding occupied Iraq was an even more ridiculous document dump; even more detrimental to the movement for justice. All of Iraq’s chaos was blamed on Iran and Iraq itself. No mention of imported Israeli torture tactics, Mossad wreaking havoc with car bombs and IEDs from Mosul to Baghdad to Najaf, Karbala and Basra, Israeli intelligence stealing Iraq’s history and training Kurdish collaborationist militias in the north or more than 70 Zionist-owned companies annexing land across the occupied nation. And obviously, no mention of Israeli-trained PKK killing American occupying forces on the ground, creating the illusion of war. Nearly 400,000 documents and the name of Zion was nowhere to be found. An Israeli MK even cited Wikileaks as a means to try the United States of America, the Zionist entity’s patron in the amount of at least $3 billion a year, for war crimes before the UN. The brazen MK went as far as filing a complaint with the UN Security Council. The same UN, that did Israel’s bidding 20 years ago and implemented genocidal sanctions against Iraq that murdered 1.7 million Iraqis including 600,000 children. Then came Cablegate. More propaganda. More spin. More lies. More pointless ‘leaks’ for pure entertainment. More Zionism. From the ashes of Cablegate arose a multi-million dollar book deal for Julian ‘The Whistleblowing Rockstar’ Assange. Julian was getting more air time than ever before and his ‘ultimate hacker’ legend reached another level of the stratosphere. He was praised by Benjamin Netanyahu, the Zionist war criminal who fathered the ‘war on terror,’ and like a good slave, Julian praised him right back. As a reward, Netanyahu asked his good friend Rupert Murdoch to let Julian write for his newspaper, The Australian, and Rupert obliged his fellow Zionist pig. The real alternative media kicked into high gear to pick the Zionist entity’s latest asset apart, but still, the lemmings marched right off of the cliff into the grasp of the Wiki-Hydra. Decimated by the aforementioned authors, men and women of courage and journalistic integrity, while simultaneously propped up by bloody Zionist money, Wikileaks tried a different approach to restore it’s shattered aura of credibility. It released its documents, this time solely about Israel, directly to ‘alternative’ news websites. Unfortunately, the documents were overloaded with just as much wiki-garbage and wiki-drivel as before; they read like op-ed pieces from The Jerusalem Post and Haaretz, not secret and damning government leaks. Mordechai Vanunu, Julian Assange is not. The Wiki-Hydra has an army of so-called journalists, self-proclaimed activists and pathetically biased authors writing its press releases now. This same army is part of Israel’s greater gate-keeping campaign to keep the Zionist entity’s name far away from the destruction of Iraq and the false flag attacks on 9/11 in New York City, 26/11 in Mumbai and 7/7 in London. Truth, Justice and Peace; the real objectives of our struggle against international Zionism. This army is killing the struggle for what hero and Freedom Flotilla activist Kenneth O’Keefe calls, ‘a better world based on TJP, truth, justice and peace.’ This army must be stopped. Let this be a declaration of war on these fame-mongers; you know who you are. If you refuse to tell the truth about the greatest crimes of this era, then you are officially a target; you and your masters residing on stolen land in occupied Palestine, manipulating the Wiki-Hydra from the shadows. The time for pussyfooting is over. You’ve had your time to awaken. Your decision to remain in deep slumber, while taking unsuspecting young minds into the nightmare with you, has now resulted in the murder of innocents from Iraq to Afghanistan, Palestine to Kashmir, Pakistan to the streets of America’s cities. This is the throw-down of the gauntlet. While Zionist asset Julian Assange’s Wiki-Hydra generates more heads as we speak, the real alternative media is aware it is time to drive the stake through the heart and put it away once and for all. Israel’s favorite PSYOP may not want to die at the moment, but you better believe that we will push it to the brink until it decides to do so.